My recent audition of the Focal Scala loudspeakers (on this website) was my introduction to this preamplifier. It was used to drive the 300 watt/ch Boulder 1060 power amplifier and accommodate the Teac Esoteric CD playback system — all scheduled for review. This is VAC’s top-of-the-line preamplifier and the most recent component of the Signature series, which, I understand has been around for over eight years. I haven’t paid much attention to VAC, but am familiar with some of the products I have auditioned at trade show and at dealers — and while they all sounded good to me, nothing has been as impressive as the two-piece Renaissance Signature Mk II. As I am of the opinion that the most important component in a system is the preamplifier, I was immediately impressed with the sonic purity and musical authenticity the above-mentioned system communicated. This prompted me to examine and research the VAC’s function as a line-stage component and, of course, a switching device. Well, if looks alone could communicate sound, you would be impressed. The two components exude elegance and refinement. They offer a touch of class rarely seen in the audio business where utilitarian designs dominate. The VAC components aren’t small and cute, like some expensive electronics I am familiar with, but then again they do not appear ostentatious. Their dimensions hint at their importance, their weight suggest solidity — and the separate power supply demonstrates audio technology done right. The sculptured faceplates must have been made from a solid block of aluminum — they are 3/8 inch thick with the edges chamfered to about 1/4 inch. Finished in silky gold-speckled black, the faceplates are an almost artistic likeness of the VAC’s sound quality. To guarantee quality, all chassis parts and lacquering are done in-house. The main unit features two large gold-plated knobs for gain and input selection and two smaller ones on the left and right of the faceplate function as tape monitor and cinema direct, and mute on/off. Nice, logical layout and highly appreciated by this reviewer who, like many consumers of high-end wears bi-focals and hates to fumble. The rear panel is logically arranged and provides two sets of balanced inputs (earlier versions had one) and they can be set for RCA or XLR connectors. The line-stage version is available with up to six single-ended inputs, or up to two balanced with four single-ended inputs in addition to the tape loop. The units equipped with the phono stage offer a load control. A snazzy remote control comes with the unit. 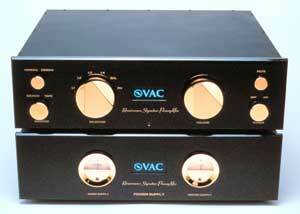 Ideally, a really great preamplifier should have little or no sonic signature which to add to a sound system. That however, is not reality, as all components in a system will add (or subtract) sonic peculiarities. A system’s final sound is influenced by all components, beginning with the AC power cord and ending with positioning them in the listening room. When we consider all contributory components of a system, it stands to reason that, ultimately, we hear the result of either a synergistic arrangement, or one that diminishes a musical performance. I always use piano recordings that are well known to me; they include Yamaha, Steinway, Baldwin and Boesendorfer pianos — all with their particular personalities. When I can recognize the sonic character of these different pianos, I know that I’m onto something special. I then assess the component’s additional capabilities. I look for its ability to recreate a soundstage, its capability to capture and reproduce harmonics, space, timbre, resolution, and, of course, its musicality. The music I used for this evaluation is part of a collection of well-produced jazz, blues and classical CDs. Rather than talk about my choice of music or one or the other track, I would like to point out that the genre isn’t or should not be as important an issue as that of concluding the musical material in its entirety. I brought my own Wyetech Labs Ruby mono-block power amplifiers to establish a reference with which I am familiar, and evaluated The VAC’s performance based on this and the Boulder system combination. I should state here that in my own systems, I use the Wyetech Labs Ruby preamplifier, which I regard as a credible, indeed a reference component that keeps outperforming most preamps I have run across. On rare occasions, I have found that it was not compatible; although relatively neutral-sounding, it has the propensity to be heartlessly revealing. Simply put, it can sound rather clinical when married with the wrong power amplifier and source components. Nevertheless, my first auditions were with the VAC connected to the Boulder amp with the Esoteric separates as source components. This system arrangement achieved such a high degree of realism that it left me with the impression that I was listening to a piano in the room with me. When I switched to the Wyetech Labs amps, two elements became known. Firstly, it was a good match and allowed the amplifiers to perform at their best. This is a tip-off regarding the VAC’s sonic disposition, which I consider to be among the very few designs with that organic, natural touch. The music was, in fact, better and more melodious than I expected, yet, I recognized the amps’ speed, clarity and articulation (a good thing, for it allows users to choose amplification that suits their taste). Secondly, though I recognized the Wyetech Labs’ sound, I also noticed a slight overall tinge, the sort that actually enhances the musical properties of pitch, rhythm and tonal colour. While this is an entirely personal opinion, I believe that the VAC introduced a stage of musicality, more closely resembling an unamplified performance where there isn’t pro-sound equipment with its colouration and potentially inflated dynamics to deceive the listener. Nevertheless, The Wyetech Lab amps sounded a bit colder than I anticipated. With the VAC connected to the Wytech Labs and Boulder amps, I began to listen and compare the sound of the two system configurations. However, after I had listened to half a dozen tracks on both systems, I decided to continued and play back all of my piano CDs on the Boulder system, which I thought was a better musical arrangement. On it, my piano recordings were more revealing, thus better approximating the various instruments’ signature. This plainly showed that the VAC/Bolder combination presented the synergy needed to elicit the necessary harmonics — the stuff that reveals an instruments personality. The VAC faithfully reproduced the instruments performing in the high frequency domain. Trumpets had the distinctive bite of horns and it was quite easy to distinguish cornets from other horn instruments. I couldn’t help but be impressed with the VAC’s knack to reproduce saxophone, revealing the swishing, smooth sound of the instrument as it moved air swiftly through its reeds. This, along with the preamp’s ability to extract subtle detail was, again, like a live performance in my listening room. Highs, produced from violins, pianos or triangles, all sounded crystal clear and without even a hint of stridency or glare; yet, the instruments sounded authentic and the system’s resolution was accomplished right up to the dog-whistle range. However, the highs never dominated the midrange frequency segment — the most important part where most of the musical material and voices are. t is interesting to see/hear that complex music written for large orchestras seems to come together harmoniously, but simultaneously allows singling out any one instrument of the orchestra. Inner detail is simply superb and marries effortlessly with dynamics. Forte and fortissimo passages are within a comfortable scale and come across very organic. Nothing seems out of balance and that at very high and very low volumes (If you have neighbors that complain about the volume, turn your system down — you’ll not loose any detail). Bass is made up of frequencies ranging from about 80Hz to 160Hz (upper bass) and from 160Hz downwards. The VAC handles all of it with the proper authority (resolution) and substance. There are loads of harmonics above fundamental notes and I found it pleasing when listening to contrabass, electric or synthetically produced music. It doesn’t dominate, but it is resolute with appropriately reproduced tonal distinction. Bass drums and, my favourite, Hammond B3s literally got me off my seat as I could picture Jimmy Smith and company (on an old CD titled Some Serious Blues) playing for me. The only thing left to say is that imaging isn’t good or even very good, it is out of this world; and it’s out of the speakers. I wouldn’t call it three-dimensional, I’d call multi-dimensional with instruments on the (invisible) soundstage in revealing focus. The soundstage has sensible boundaries and there is a realism relating to the size and location of the instruments. When the setup is right (and mine was) it is difficult to locate the loudspeakers with the eyes closed. At the end of the auditioning session, I wound up listening to some CDs just for the pure enjoyment of music. In fact, a couple of weeks later, I returned with contributing Editor David McCallum for one more listening session; and we both simply sat, listened and appreciated the result of this very carefully assembled system. We didn’t really “audition”, we listened to a variety of music — some parts with very complex arrangements — and talked about the system’s knack of not getting in the way by emphasizing one or the other component. Later, when we discussed the sound, we agreed that the entire system was special; not because of any one element being better than we have heard before, but because of its all-round ability to deliver a live-like performance. The system’s ability to handle and control the softest as well as the loudest musical passages — its dynamic range — was beyond compare and it was quite evident that the VAC’s presence heightened the system’s musical caliber. I’d like to compliment American Sound’s Angie Lisi for assembling one of the best music systems I have heard and, I might add here, not readily found at retailers. Those of you, interested in specifications — rejoice. This component is made with the precision of Swiss watchmakers housed in chassis resembling the solidity of tanks. Transfer of resonance is almost impossible as there is practically no buildup of vibration caused by energy storage. I place this on top of the many problem-causing elements in gear, because along with a music signal vibrations are amplified, thus diminishing clarity, space and tonal precision. As this in under control from the get-go, further technical creativity complements the design. The Signature preamplifier has no coupling capacitors from input to output, because they can obstruct signal purity and detail caused by direct-coupled Class A1 triode tubes used here. As well, the unit hasn’t a negative feedback loop; the output interface is said to be100 percent stable and free from dynamic interactions with the load. Five standard RCA line inputs (four when phono is added) and fully balanced inputs are also provided. Of course, there are also fully balanced outputs. The Signature’ balancing is accomplished by differential triodes that drive a special output transformer — a methodology which renders a true balanced signal (tube-based preamplifiers using cathode followers can not accommodate balanced circuitry). The Signature’ transformer output may also be used with unbalanced loads. The line stage provides a fully buffered tape loop and a “cinema bypass” mode, allowing integrating the preamp with home theater (shame on you). The cinema bypass is a fixed gain input that allows volume-controlled source components and passes this signal through to the stereo power amplifiers without further processing. Though possible to integrate two-channel seamlessly into a home theater milieu without degrading two-channel performance, I recommend a separate system nevertheless. Those with turntables can order the unit with the optional phono stage. It is a zero-feedback design featuring six triode tubes. It is made to accommodate low output moving coil cartridges and is adjustable on the unit’s rear panel via a switch that engages a separate wideband transformer. The separate transformer and filter circuit prevents interference/interaction with the more powerful line stage and provides load switching for the cartridge used in the tone arm. This high-end component comes with a unique remote control system that employs electromechanical switches and controls. Costlier than digital interfaces, this arrangement has several major advantages as there are no relays, or transistor switches (switched ladder networks) used in controlling volume, thereby guaranteeing contamination-free operation. In addition, VAC avoids the use of microprocessors, which invariably generate noise that degrades sound. All front panel controls are wired directly and, I daresay, appeal to hands-on logic, just the way it should be. Lastly, the VAC’s internal components are selected from the best available, chosen not only for their quality, but also for the sonic characteristics. This means that many hours of research and listening tests (voicing) preceded the choice of components, to assure that the result is a technical arrangement with which to achieve the musical performance described in this evaluation. For those interested in the design philosophy and other details, there is a lot more on the VAC website ( VAC-Amps.com). However, this evaluation is based on listening tests and the musical element of the audio experience, rather than the technology with which to achieve it.